We all have been expecting this announcement by Sammy today. The company had initially hinted at the launch of the Exynos 9 Series 9810 Processor and now, BOOM!! 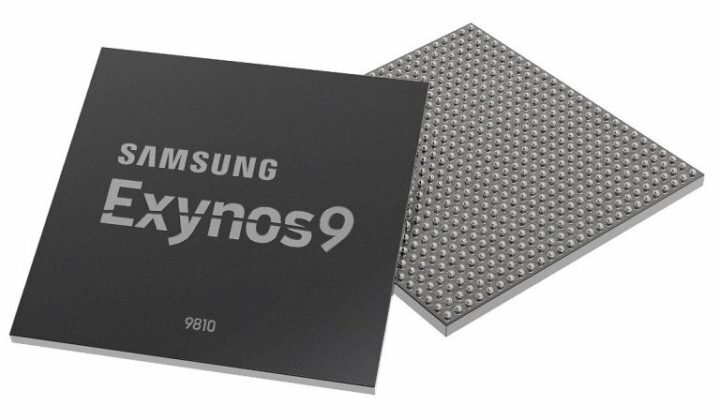 !, the Samsung Exynos 9 Series 9810 SoC is official. Don’t forget that all things being equal, the Samsung Galaxy S9 series will be announce next month or so, and as the trend with Samsung, the Galaxy S9 and of course, the Samsung Note9 will be powered with Exynos 9 Series 9810 Chipset. The Exynos 9 Series 9810 SoC is the successor of Exynos 9 Series 8895 SoC that powers the Galaxy S8 series and the Galaxy Note8. The new comer is based on the 2nd generation 10-nanometer (nm) FinFET process technology, and has new eight-core CPU with four of the company’s powerful 3rd generation custom designed CPU cores that can be clocked as high as 2.9Ghz, along with other four optimized for efficiency and an industry-first 6CA LTE modem with deep learning processing capabilities. LTE Cat.18 6CA-supported modem has support for up to 6x carrier aggregation (CA) for maximum download speed of up to 1.2Gbp (Cat.18) and 200 megabits per second (Mbps) uplink. Modem supports 4×4 MIMO (Multiple-Input, Multiple-Output) and 256-QAM (Quadrature Amplitude Modulation) scheme, and utilizes enhanced Licensed-Assisted Access (eLAA) technology. Neural network-based deep learning and stronger security allows it to accurately recognize people or items in photos for fast image searching or categorization, or through depth sensing, scan a user’s face in 3D for hybrid face detection. Utilizes both hardware and software, hybrid face detection for realistic face-tracking filters as well as stronger security when unlocking a device with one’s face. Separate security processing unit to safeguard vital personal data such as facial, iris and fingerprint information. Dedicated image processing offers faster and more energy-efficient image and visual processing for advanced stabilization for images and video of up to UHD resolution, real-time out-of-focus photography in high resolution and brighter pictures in low light with reduced noise and motion blur. Upgraded multi-format codec (MFC) supports video recording and playback at up to UHD resolution at 120 frames per second (fps). 10-bit HEVC (high efficiency video coding) and VP9 support can render 1,024 different tones for each primary color (red, green and blue) that translates to a vast 1.07 billion possibilities of colors, or 64 times the previous 8-bit color format’s 16.7 million. The Exynos 9 Series 9810 is currently in mass production and we will surely hear more about this Chip when the upcoming Samsung Galaxy S9 goes official next month.